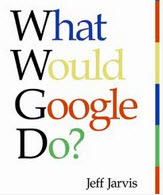 Title: What Would Google Do? Author: Jeff Jarvis Publisher: Harper Collins, 2009. Jeff Jarvis (1954) is an American journalist, creator and founding of Entertainment Weekly and Sunday editor of the New York Daily News. He is associate professor and director of the Tow-Knight Center of Entrepreneurial Journalism at the City University of New York’s Graduate School of Journalism, and his blog Buzzmachine.com is one of the Web’s most widely respected blogs. Nowadays, the market where a business idea grows is no longer in our city or country, but worldwide. What Would Google Do? is not only a book, but an indispensable manual for surviving in the Internet age. Google has become the fastest-growing company in the history, which means that if you want your business succeed, you should think like Google.The author give the cues to do that, applying a set of principles not just to emerging technologies but to other industries like airlines, television, education, healthcare and others. “Google is not just a company, it is an entirely new way of thinking about understanding who we are and what we want. Jarvis hoas done something really important: extend that approach to business and culture, revealing just how revolutionary it is ” Chris Anderson, author of The Long Tail. Esta entrada fue publicada en Libros / Books, Psicólogo Online y etiquetada como Brain, business, buzzmachine.com, Dr.Guilera, Emotional Intelligence, Entertainment Weekly, Google, Intelligence, Jeff Jarvis, journalist, psicólogo online, psicologo infantil barcelona, telepsicologiainfantil, telepsicologiainfantil.net, Telepsychology, United States.